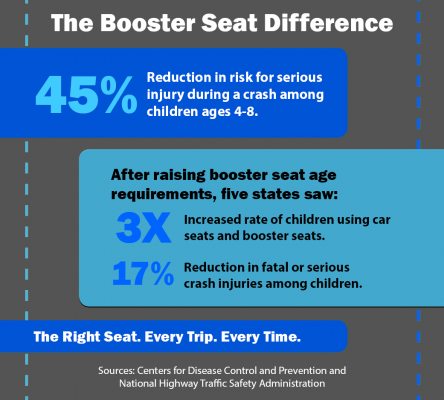 Booster seats and car seats save kids’ lives. Until your child is taller than 4’9″ (generally 8-12 years old), your vehicle’s seat belt won’t fit correctly. The right car/booster seat keeps your child in place so that all of your car’s safety features can work correctly during a crash. Use the Right Seat. Every Trip. Every Time. A seat belt alone may not be enough. This crash test shows how a lap belt alone isn’t enough protection for a 6-year-old child during a car crash. Booster seats allow your car’s safety features to be as effective as possible. 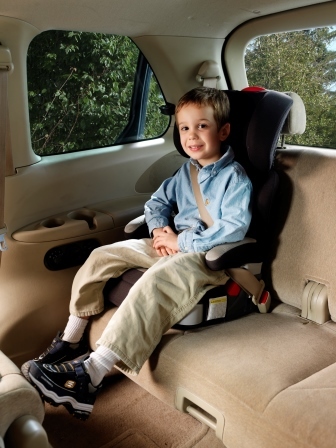 Learn more about Booster Seat Guidelines, Installation, Recalls and Laws. 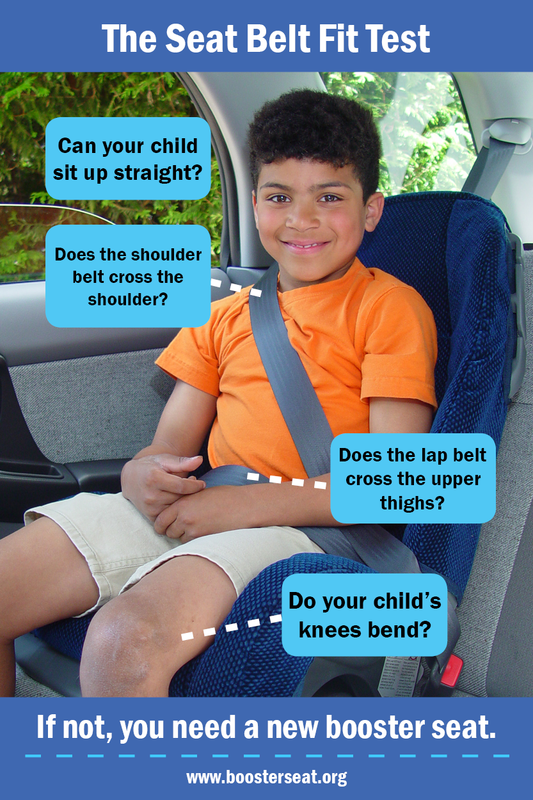 Make sure your child uses the correct seat belt, booster seat, or car seat for every trip. And when you wear your seat belt too, it sets the example that safety is important. Booster Seat information in English, Spanish, Amharic, Chinese, Oromo, Somali, and Vietnamese is available from Seattle Children’s Hospital. When shopping for car seats or booster seats, pay close attention to height and weight requirements. 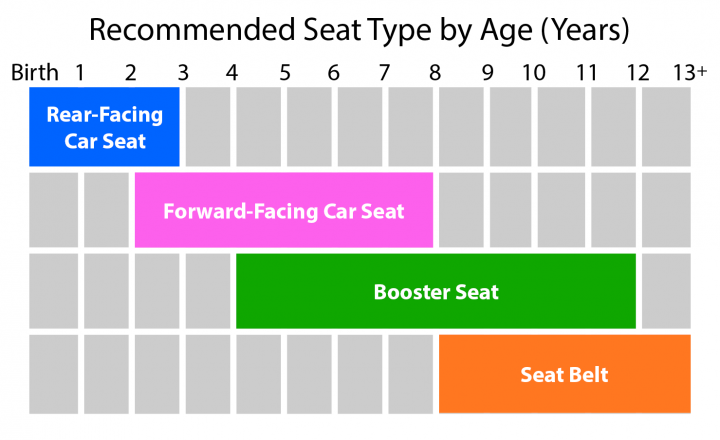 Check that your child has reached the maximum height or weight before moving on to the next type of seat. Never use second-hand car seats or booster seats and pay attention to car seat recalls. Does it fit my child? Use the owner’s manual as a guide. Does it fit my vehicle? Your child and all the other passengers must be seated safely when the booster seat or car seat is installed. Is it easy to use? The easier the seat is to use and adjust, the more likely you are to use it all the time. Does it fit my budget and lifestyle? Consider how often you change vehicles, how many children need boost seats, and other factors. Suggested ages are general guidelines, but height and weight are the most important factors when choosing a seat. The Insurance Institute for Highway Safety Highway Loss Data Institute also conducts booster seat evaluations for additional help. Usually Fits: 29-32 inches and 4-30 lbs. Always check manufacturer guidelines. Children should be in rear-facing seats through at least age 2 and until they reach the manufacturer’s maximum recommended weight and height. It is fine if your baby’s feet touch the back of the vehicle seat or their legs naturally bend while in the car seat. Pros: Portable, attaches to strollers, lifts out of base in the car. Cons: Must be replaced with a forward-facing car seat once your baby reaches the upper limit on weight or height. Usually Fits: Up to 52 in. and 5-65 lbs. Always check manufacturer guidelines. Works as either a rear-facing or forward-facing car seat, based on the child’s size. 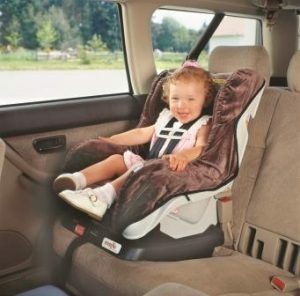 Keep children in the rear-facing position until at least age 2; use the rear-facing position as long as possible until reaching the maximum height or weight in the manufacturer guidelines. Children’s legs may bend naturally against the back of the vehicle seat when they are in a rear-facing position. This is fine as long as the child is still within the manufacturer’s height guidelines. Pros: Can be used longer with a greater range of weight and height, as the rear-facing seat “converts” to a forward-facing seat as the child grows. Cons: Takes up more room, cannot attach to stroller. Usually Fits: Over 20 lbs., minimum 2 years of age. Always check manufacturer guidelines. May be able to convert to a booster seat when your child is tall enough or weighs enough, but follow the manufacturer guidelines. Note: Children should be kept in rear-facing car seats as long as possible (until they reach the manufacturer’s maximum recommended height or weight). Usually Fits: Children who have outgrown forward-facing car seats but do not yet fit adult seat belts (minimum 40 lbs.). Available in two styles: High-back and No-back. The owner’s manual will help determine the best option for the age and size of your child and the specifics of your vehicle. High-back booster seats can be used in vehicles with or without headrests. 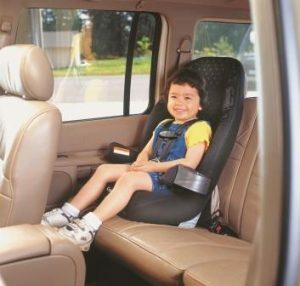 No-back booster seats can generally be used where your vehicle has a headrest that fits the child comfortably. How should the seat belt fit when you child is in a booster seat? Lap belt: Low across the hip bones, touching the top of the thighs. Shoulder belt: Across the center of the shoulder. When the child leans forward and back, the belt should unspool easily and retract without leaving slack. Seat belts should be worn by themselves only when they fit your child correctly, which can vary by vehicle. A properly fitted seat belt ensures your car’s other safety features are as effective as possible during a crash. Has a lap belt that sits low across the hip bones, not on the abdomen. Has a shoulder belt that lies across the center of the shoulder and chest, not rubbing against the neck or tucked behind the arm. Fits your child when they sit all the way back in the vehicle seat with their knees bent comfortably. Can be worn properly through the entire ride. Is used every trip, every time, by everyone in the car. You set the example. 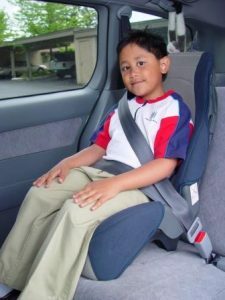 When installing a booster seat, follow the owners’ manual for your booster seat as well as your vehicle regarding “child restraint systems.” These guidelines will provide instructions on seat placement and angle. Booster seats must be used with a lap and shoulder belt, not a lap belt alone. In the Seattle area, Seattle Children’s Hospital regularly offers free car seat checks to ensure proper installation and fit. Specific car seats vary, but National Highway Traffic Safety Administration installation instruction videos offer useful guides for the most common types. In the car, where should I install my booster seat? Booster seats must be used with a lap and shoulder belt together. If the center of your back seat has a lap-only belt, place the booster seat in an outboard seat that has a lap and shoulder belt. Which type of booster seat do I need? A no-back booster can be used in cars with headrests in the back seat. If your child’s head does not rest comfortably in the headrest, use a high-back booster seat. The above video playlist from NHTSA includes instructions for installing various types of car seats and booster seats. Use the menu in the top left corner of the video player to browse different seat types. Get free help ensuring your car seats or booster seats are installed and fitted correctly. Car seats and booster seats may be recalled due to documented mechanical problems, mislabeling that can lead to confusion, incorrect user instructions or other safety concerns. Register your car seat or booster seat with the manufacturer to receive important notifications about your product. Register with the National Highway Traffic Safety Administration to receive recall notifications. Visit NHTSA’s Child Seat Recall Listing to review the most recent recalls. Children under age 2 must use rear-facing car seats. Children should remain in a rear-facing car safety seat as long as possible, until they reach the highest weight or height allowed by their seat. 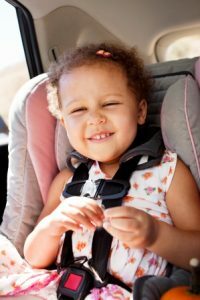 Children ages 2 to at least 4 years should use a forward-facing, age-appropriate child harness seat – and do so as long as possible, until they reach the seat’s height and weight limits. Many seats can accommodate children up to 65 pounds. Children older than 4 but shorter than 4’9” who have outgrown the child harness seat must use booster seats. Most kids will need a booster seat until 10 to 12 years of age. When children are old enough and large enough to use the vehicle seat belt alone, they should use lap and shoulder seat belts for optimal protection. 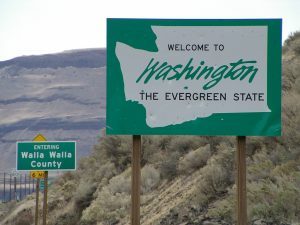 Outside of Washington, laws regarding child safety restraints vary by state. The Governors Highway Safety Association offers a state-by-state overview of restraint laws.